Berlin, the capital city of Germany, is known for being one of the most creative, hip, progressive cities in Europe, if not the world. Visit Berlin and discover a city packed to the brim with history and overflowing with funky food, incredible culture, and stunning artwork. Explore the 12 unique districts that make up the city. 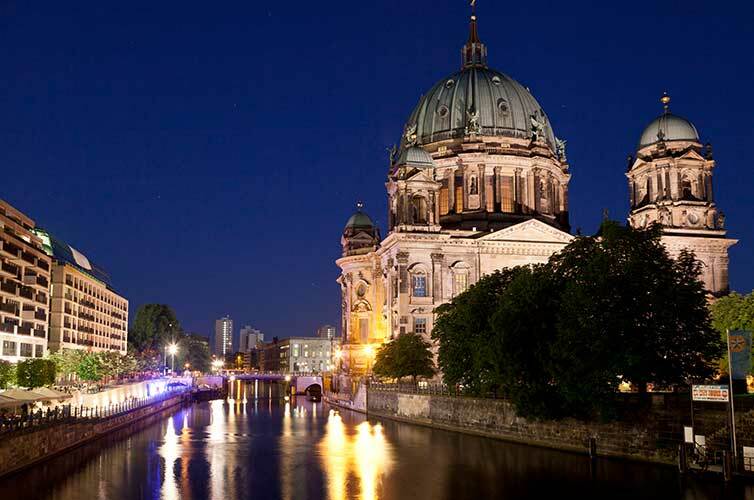 See the Berlin Cathedral and shop ‘til you drop along the most famous shopping street in town, Kurfürstendamm, and the small local shops and designers you’ll find in Berlin’s many side streets. 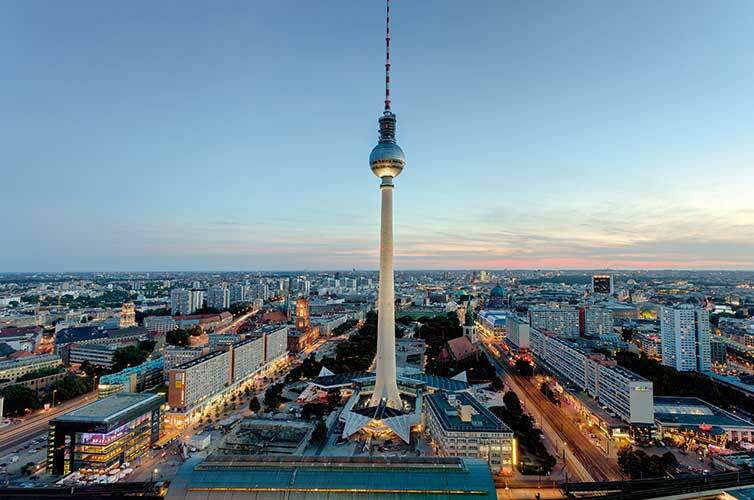 Take in views of Berlin from the Berlin Television Tower. Not convinced yet? We’ve got nine more reasons why Berlin needs to be on your bucket list. Although it’s known now as the City of Freedom, it hasn’t always been. With the horrors of the Nazi regime, the Cold War, and the Berlin wall all in the city’s recent memory, freedom wasn’t always a mark of life here. However, Berlin has continued to become a place where citizens have fought for freedom, acceptance, and progress. It’s a city of change and creativity: and Berliners take social justice and diversity seriously. Get ready to explore the contrasts of old and new in the diverse, edgy, and international city of Berlin. Although Berlin is a well-known city, lesser known are the 12 neighborhoods that comprise the city. Each of the boroughs are vibrant and distinct while still holding onto classic Berlin. With literally a dozen ways to discover Berlin, how do you know where to start? Of course, there is Mitte, the city center and the cultural and historical heart of Berlin. There’s also Charlottenburg-Wilmersdorf, the elegant City West or Pankow, chill and creative on the East side of Mitte. Head to Neukölln for a bustling blend of old and new Berlin and amazing street food. Friedrichshain-Kreuzberg is for sure one of the hippest neighborhoods in Germany (if not the world). It’s famous for being home to creative and diverse lifestyles. It’s also famous for being home to the highest density of clubs in Berlin: no one has a bad time in Friedrichshain-Kreuzberg! Pro Tip: Wish you had a local to guide you around? Check out the Going Local Berlin app. It has maps and guides for all 12 of Berlin’s districts that you can use offline (score!). Plus, there’s hundreds of insider tips and recommendations from locals. Berlin is quickly gaining a reputation as a culinary hotspot in Europe. From authentic German meals to international street food to abundant vegan options, Berlin is a paradise for any foodie. Try as many types of wurst as you can handle and then make room for the iconic “Currywurst”: sliced bratwurst topped with curry ketchup. Locals flock to Konnopke’s Imbiss for some of the best currywurst in town. Of course, there’s more to try than just wurst! Did you know Berlin is known as the vegan capital of Europe? 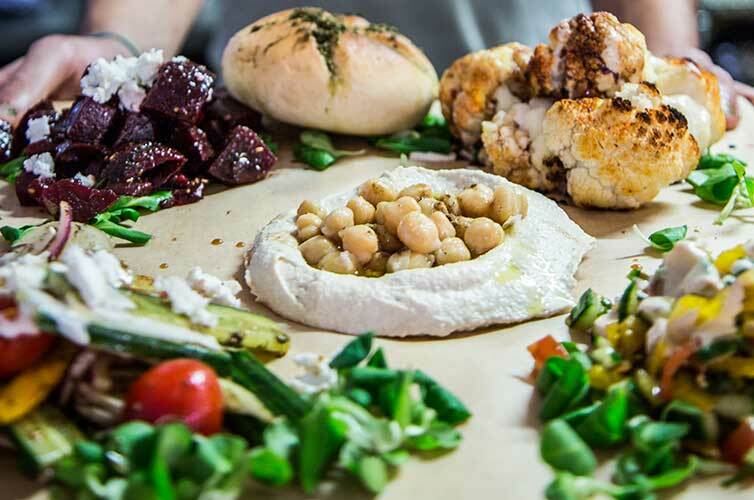 You can fill up on fresh, local and vegan food at restaurants like Daluma, Kanaan and Voner. These up-and-coming restaurants offer smoothies, acai bowls, salads, and even classic German kababs (sans-meat, of course). They’re also committed to sustainability and green living (and eating). Need more inspiration during your trip to Berlin or have a great local gem to share? Check out #visit_berlin on Instagram. Berlin might be a modern city, but it has plenty of history, too. The obvious can’t-miss is a trip to the Berlin Wall. The East Side Gallery is the longest remaining section, now filled with graffiti murals. The wall can get quite crowded during the day, so head there early to beat the crowds. The Berlin Wall Memorial is a good place to learn more about the history of the wall. Another can’t miss is the Brandenburg Gate: the only remaining historical city gate, it’s now a symbol of Germany’s reunification. Berlin’s history doesn’t stop with the wall. Take a sobering walk through the Holocaust Memorial. The outdoor memorial is open 24 hours a day. A small Holocaust memorial spread throughout the city are stolpersteine (“stumbling stones”). These small brass stones are placed into the streets to mark homes and workplaces of Jewish individuals that were victims of the Holocaust. You’ll notice them all over the city. Of course, there are plenty of museums that hold even more history: check out the Deutsches Historisches Museum (“German Historical Museum”) to start, then explore Berlin’s smaller historical museums scattered around the city. Ready to get to know Berlin even better? Check out the visitBerlin app, featuring storytelling and history behind over 200 destinations and landmarks in Berlin. Hear the fascinating stories behind some of the beautiful places in Berlin for free and at your own pace as you explore the city! Berlin is an urban city, but it’s not all gray. 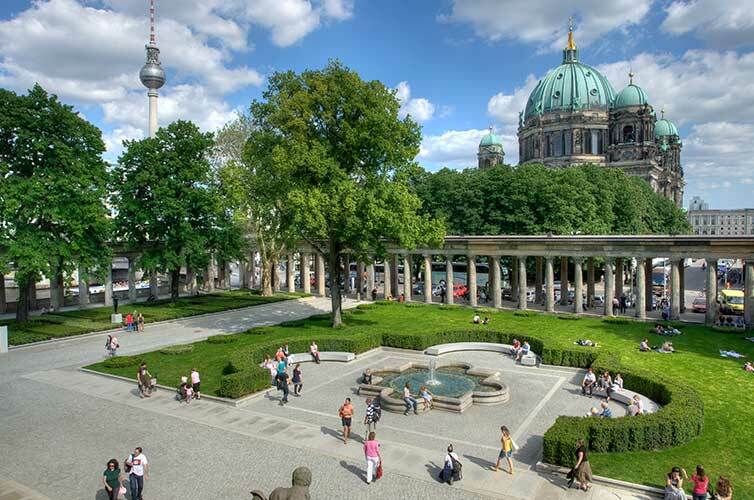 From it’s sustainability initiatives, to a rising focus on green fashion and vegan and organic food, to the dozens of green spaces, parks and waterways through the city, Berlin is a great place to go green. Shop at one of Berlin’s weekend farmer’s markets for fresh and organic local produce. Enjoy a picnic in a famous park, such as Tiergarten or Britzer Garten. Pick up some eco-friendly souvenirs at one of Berlin’s many green stores or markets. Ready to take going green to a whole new level? Visit Berlin during International Green Week (usually in January) for fairs and exhibitions about green food, modern farming and discussions on renewable and sustainable energy and agriculture. Plus, there’s tons of shopping and tasting to be done! With over 180 museums, you might need to get a few trips to Berlin planned just for the museums alone! If you don’t have all year to explore, though, we’ll help you narrow it down. Definitely don’t miss out on visiting Museum Island. Museum Island sits in the Spree river and is a stunning UNESCO World Heritage site, home to five of Berlin’s most famous museums. From art to architecture to ancient artifacts, Museum Island is definitely worth a visit. Those aren’t the only museums to see, though: visit the Gemäldegalerie for classical European masterpieces or the DDR Museum for an interactive look at Berlin’s history. Berlin has its share of lighthearted museums, too: take a break at the Museum of Illusions or the Museum of Things. Remember that many museums aren’t open on Monday, so plan accordingly! Feeling… dehydrated? Bottoms up in Berlin! Everyone knows it’s a good time in Germany, but Berlin has made it easy to have a really good time. Unlike many other German cities, there’s no official closing time. Party ‘til the sun comes up and then grab a big breakfast at one of Berlin’s brunch spots. No one loves brunch like Berlin does, and many cafes serve breakfast all day long. Not quite up to partying all night? No worries, because buses and trains run all night long too. And just as each district has its own unique vibe, you’ll find a variety of nightlife vibes in different neighborhoods too. Dance the night away on the banks of the Spree and pay a visit to the famous Watergate, known for helping create the “Berlin sound.” Get rooftop views at the Monkey Bar. Try to get into the Berghain, one of the largest and most famous nightclubs in Berlin with an infamously strict door policy. Or grab some classy (and cheap) cocktails at Geist im Glas. Bonus points for their fantastic pancakes and breakfasts for the next morning. Looking for a chill evening? Check out some of Berlin’s beer gardens. The Prater Biergarten is the oldest, but Schleusenkrug and the stunning Klunkerkranich rooftop beer garden are other great options. 8. The City that Never Sleeps? It might be impossible to get bored here. Between the endless museums, street art, local shops and markets, things to see, and all-night parties, this city packs a punch. Even if you’re not ready to stay out all night, there’s plenty to keep you going as long as you’re in town. ​Once you’ve seen all the basics (Alexanderplatz, Brandenburg Gate, Eastside Wall Gallery, etc. ), be sure to take some time to explore Berlin’s edgy side. For example, the graffiti murals scattered across the city are a huge staple of Berlin’s art culture. You can’t miss them anywhere around the city, but check out the street art along Dirckenstrasse or the graffiti murals at Teufelsberg (a super eerie abandoned listening station from the Cold War). The Mauerpark Graffiti wall is a legal graffiti zone. It’s a great place to hang out and enjoy the art or leave your own mark on the city! Even better, any season is a good time to visit Berlin. Visiting during Christmas time? Don’t miss out on Berlin’s famous 60+ Christmas markets. Two big ones are the Christmas Markets at Gendarmenmarkt and Alexanderplatz. The Berliner Weihnachtszeit at Alexanderplatz even has an ice skating rink and a giant Ferris wheel! Take a kayak or boat tour of the city in summer, when days are warm and long or catch the cherry blossoms brightening up the streets around the city in the spring. (The cherry trees were a gift from Japan after the war.) In the fall, enjoy fall colors and fresh produce at a local farmer’s market, like the Saturday market in Boxhagener Platz. Ballin’ on a student budget? Good news: you don’t have to spend a ton of money to visit Berlin! Some of Berlin’s most famous sights are free, such as the Brandenburg Gate and Holocaust Memorial. And of course, there’s plenty of great places to explore for free as well: giant public markets, outdoor graffiti murals and the public parks and gardens. Also keep in mind that many museums and sights offer reduced entry prices for students, so keep that student ID handy! Another great way to save money is to get a Berlin Welcome Card. You can get cards for various lengths of time (from 2-6 days) starting at just €20 ($22). All cards include free public transportation for the duration of the card as well as discounts to dozens of things to do, restaurants, stores and over 40 museums and palaces. ​Ready to plan your trip to Berlin? We thought so. Get $75* off flights to Berlin with promo code VISITBERLIN. Plus, download the free About Berlin app from visitBerlin or explore www.visitBerlin.com for storytelling and hands-on history for destinations across the city. *VISITBERLIN Promo Code Terms: The promotion code entitles you to a $75 discount on the purchase of one (1) airline ticket at StudentUniverse.com. Valid for one-way and roundtrip flights from the United States to Berlin. Offer not valid on hotels, insurance or previously booked flights. Promotion Code is limited to a one-time use only per person. Coupons/Discounts cannot be combined with any other offer. Discount will not be applied to taxes and fees. Promo code valid through December 13, 2018. Limited redemptions available.